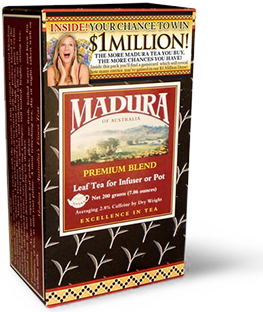 WIN A MILLION DOLLARS WITH MADURA TEA! Unique Consumer Incentive Sells Tea by the Truckloads! Madura Tea is an Australian producer of high quality tea, with its products being widely available through the likes of Woolworths, Coles, Bi-Lo and others. Because it is a relatively small player in the Australian tea industry (Twinings and Dilmah are market leaders), the company wanted to get serious about building their brand name in the marketplace. John was engaged to provide his expertise in delivering both a short and long-term marketing strategy that would sell tea and build the brand’s awareness. Although having a relatively modest budget, John was able to devise an innovative Cash Giveaway Promotion involving an Insured $1 Million Prize. The promotion ran for 4 months and was supported by a daytime TV campaign in regional areas along the East Coast of Australia. If you look at the TV advertisement here, you’ll see that it combined brand-building testimonial comments from customers together with the Chance To Win $1 Million incentive. This turned out to be a magic “combo”, with sales instantly exploding in all areas where the TV campaign screened. Instead of the conventional “1 entry per pack” mechanism, John pushed the envelope and gave consumers a “lucky dip” sensation – where they could gain between 1 and 10 instant entries from each pack. Inside each of the specially marked Madura Tea packs, a Game Card could be found with 10 digits being printed on it. Consumers enjoyed “instant gratification” because upon checking their Game Card, they invariably came up with 7, 8 or 9 entries into the Million Dollar Draw! John goes onto explain “remember the anticipation as a child, when you would be on the edge of your seat when opening the Kellogg’s cereal pack, anticipating which toy you might get? Or likewise, the same thrill you got with a pack of footy trading cards? Well the same principle applies with sweepstakes. 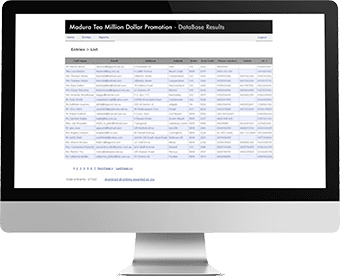 Because all entrants had to register online at Madura’s website, a massive bonus of over 50,000 email addresses just adds to the success of the promotional campaign. With emailing having no costs, such a database provides Madura with lots of opportunities to regularly market new lines or online offers.